Well done to Imogen Camp who represented Wales in the 8th World School Individual Chess Championship. diary she kept on Facebook. The English party also sent reports which you can read on the ECF website. It is a 9 round tournament being held in Iasi, Romania from 28th April to 6th May. Imogen was selected to participate because she did so well in the UK Schools Chess Challenge last year becoming the Under 10 Ultima. Phil Ehr, the new English Junior Director, recognised the achievements of ECF members who did well in this event and offered places to the Ultimas and Ultimos. This also meant 3 other welsh juniors had the chance to go - Ultimas Megan Owens (U16) and Stephanie du Toit (U9) and Ultimo Ben Thmoas (U11). Only Imogen was able to accept her place and so she will be the only Welsh representative accompanying the English delegation of 23 players. This will be Imogens international debut for Wales although she was selected for the European Youth and World Youth last year. Not only has she done well in the UK Chess Challenge in recent years but she also held the U8 and U10 Girls British Championship titles. 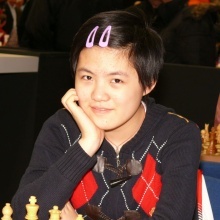 This young lady is already successful and I hope she is able to play her best chess and has a great tournament.